A few years ago while living in China I went back home to Kansas City for a short trip. One day I was riding in a car with my mother and we passed a child about five years old sitting alone on the sidewalk. My mom asked if I’d “seen that”. I had, but it didn’t register what she was referring to. “Oh yeah,” I said dismissively. “We’d better go back and make sure he’s ok,” she said as she pulled onto the next street to turn around. “K…” I answered, just starting to realize what the big deal was. By the time we got to the boy, another woman had also pulled over to see what was up. We all walked around with the child looking for his parents until eventually we called the police. An officer showed up within ten minutes and took the boy to the station. As soon as I saw that the other woman had pulled over, it immediately sank in what I’d just done…or rather, what I’d failed to do, and it made me sick. Had I been alone in the car, I would have kept on driving. I was ashamed because it’s not something I would have done just a few years earlier. China had desensitized me. 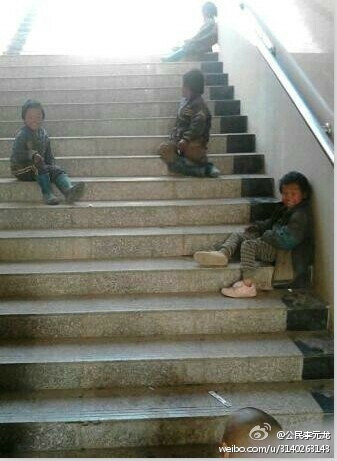 Last week five young Guizhou children were found dead in a dumpster from carbon monoxide poisoning after they’d climbed in and burned coal to stay warm. They’d been missing for three weeks after running away from home. Someone apparently even took a picture of them sitting in a public place the day before their deaths, but still, no social safety net caught them in time. I wasn’t the least bit surprised. People wrote heartfelt messages of sorrow and disgust online, but I imagine if they’d walked by the kids sitting alone on the street themselves, most would have just kept walking by. It pains me now to say it, but I’ve done it dozens of times myself. It’s not that people in China are heartless. The sight of children running around alone is just so depressingly common that it’s barely enough to raise an eyebrow. Sometimes they’re child beggars being exploited by a guardian watching from around the corner. Sometimes they’ve just been left to run about by parents who’ve never been warned by the always-harmonious media about China’s epidemic of child kidnappers. These unaccompanied children are ubiquitous and there’s been very little done to educate society that this isn’t a normal or acceptable thing. Unfortunately, when I entered this society I gradually forgot this myself. People have been quick to blame the parents, the school principals and local government officials for letting these kids slip through their fingers. Indeed, they all bear some responsibility, but so do all of us who’ve ever seen a child alone and kept walking. Most of all though, responsibility lies with the system that’s allowed us to become desensitized to something that’s clearly very disturbing. I think this is partly about the way people view children but also the way people view other people in general in China. Just a short trip to Hong Kong can show how people there don’t always treat those around them as merely obstacles you have to push past or dodge around to get to where you’re going. In China, your circle of concern and influence ends at about 50 centimetres from your body. It’s only when there is some kind of connection to somebody that this changes. A friend of mine went to see doctor in Beijing recently. When he arrived, he was the first one there but the doctor hadn’t arrived yet and the door to the consulting room was closed. Gradually more and more patients began to arrive and he knew that they wouldn’t hesitate to push past him in attempt to be the first to see the doctor – to treat him as a mere obstacle. So he struck up a conversation with the other patients and introduced himself, asked them about themselves etc. When the doctor turned up, those he was talking with were very careful to make sure that their ‘foreign friend’ should go first as he arrived first. In China, a child you don’t know and who is no relation of yours just doesn’t exist, unless they’re in your way, in which case they’re an obstacle you need to push past or dodge around. I agree, it’s sad. The saddest part is when we see ourselves falling in to the same behaviour pattern. We’re letting ourselves down and the Chinese people down as they expect so much more from us than members of their own society. Unless they want to be nosy. In that case, they’ll stick their face right into yours for some casual eavesdropping. To be fair, child beggars being exploited by adults is a depressingly common sight in many countries. It’s also quite common in some European capital cities. What is perhaps less common in Europe is for people to let their children play without supervision in public places. Of course if people did this because it was genuinely safe, it would be a good thing. On the other hand, as you have pointed out, it is actually not especially safe anymore in China. It might have been ok in the eighties, but not now. It’s more to do with ignorance.